Quite a few gamers were disappointed last year when video game company Konami cancelled the highly promising Silent Hills video game, with a creepy and haunting playable teaser released in summer 2014 hinting at what designer Hideo Kojima’s game could have been. But sadly Kojima was unceremoniously and controversially expelled from Konami last year, and the Silent Hills project was canned by Kojima’s former employer. Kojima moved to greener pastures though, and started his own video game studio Kojima Productions, partnering with Sony to make video games, the first of which we now know will be titled “Death Stranding”. Kojima will be working with The Walking Dead actor Norman Reedus (who was to feature in the cancelled Silent Hills), and who appears in Death Stranding’s haunting and creepy E3 reveal trailer. 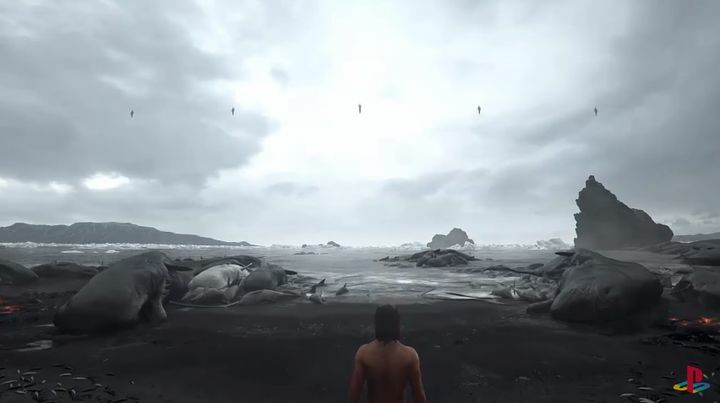 This evocative trailer opens with a William Blake poem ending with the lines “hold infinity in the palm of your hand and eternity in an hour”, and then shows us a beach littered with death sea life, before focusing on the naked body of actor Norman Reedus (we do not yet know which character the actor will play in the game). Reedus picks up and hugs a baby lying on the sand, before the infant mysteriously disappears, with Reedus following a series of handprints on the sand and the camera finally focusing on 5 figures in the distant horizon, all to the tune of Low Roar’s haunting song “I’ll Keep Coming”. There’s no doubt though, that this trailer for Death Stranding was one of the most original shown during Sony’s press conference, and likely did cause a sensation at the E3 show due its creepy imagery and haunting atmosphere. And although Sony or Kojima Productions have not yet revealed a release date for Death Stranding, it is clear that this will be one video game to look forward to when it’s released in the future.